Geek's Guide to Britain Big data? Pah. Arthur is big hardware. He weighs in at 1,118 tonnes, has a diameter of 25.9 metres and is 52 years old. From his home, a high plateau on Cornwall’s remote Lizard peninsula – as far south as you can go on the island of Great Britain without falling off – he has played his part in Space Age history, appropriate given he resembles one of its rockets in scale and riveting style. Officially known as Goonhilly 1, Arthur is one of the world’s first satellite communication dishes. This is the dish that received the first transatlantic television pictures from the Telstar satellite on 11 July 1962, tracking it as it crossed the sky in just 22 minutes. And, in a very British touch, it is a Grade II listed building. Goonhilly was one of the world’s first three satellite earth stations. Until a few years ago, it was also a west Cornwall tourist attraction run by BT, where visitors could see Arthur and friends and learn about the wonder of telecommunications, particularly those run by BT. On a rainy summer day in west Cornwall, the Goonhilly Satellite Earth Station Experience with visitor centre was the harassed parent’s last best hope. Improvements in satellite technology and the renaissance of submarine cables meant Arthur was seen as a high-maintenance dinosaur and in 2006, BT decided to switch its international communications to submarine cables and two smaller dish farms in Herefordshire and London. BT closed the visitor centre and planned to convert much of the site into a windfarm. Only Arthur’s listed building status got in the way of its demolition. 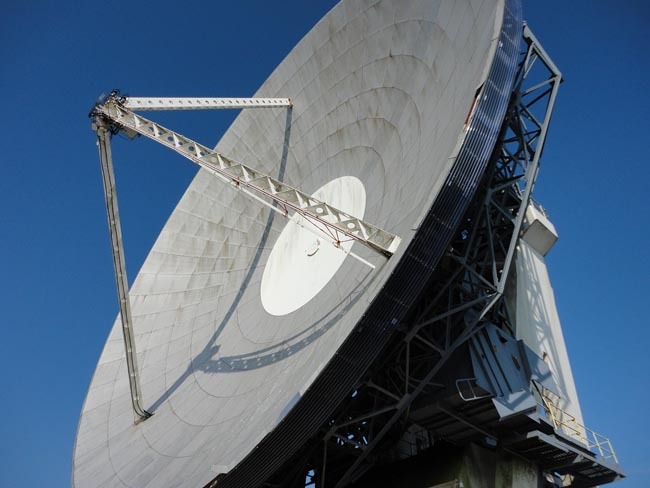 Arthur now has a new owner – Goonhilly Earth Station Ltd (GES) – and Goonhilly is being repurposed for space exploration and other specialist applications. Arthur is about to start a new career in space science, as part of a project run by Britain’s universities, 50 years after Telstar. There are even plans for a new visitor centre. This is not open yet and – with the exception of a Segway course next to Arthur, £30 per person for 90 minutes – Goonhilly is currently closed to the public. But GES agreed to give The Register an early look at what it is doing in this remote corner of Britain. Driving the ruler-straight eastern perimeter road past the offices [not officers] of the rather high-concept for a taxi-firm named Telstar Taxis, Goonhilly feels forbidding and deserted. The entrance barriers look like they guard a secret site, and a car looks small in a holding space designed for lorries. So far, this feels like a scene from a 1980s government conspiracy drama. The General Post Office, forerunner of BT, chose this site for its position on the highest ground on the Lizard peninsula, with clear views west across the Atlantic, as well as to the south and east. There are very few buildings nearby, the air is unpolluted, the weather generally good and there is little electrical interference. Geologically, the site’s hard bedrock made it suitable for heavyweights like Arthur. The air feels strangely foreign, thanks to the Gulf Stream bringing moist warm currents up from the tropics. BT continues to use the site for submarine cables – one of the most important, SeaWeMe3 that forwards traffic to Europe, the middle East and Asia, calls in at Goonhilly. It also continues to run the site’s security, meaning I have to check in with a BT guard behind a glass screen to make progress. My name is on the list, so equipped with a plastic badge I drive along more deserted road, with signs in the swirly font that BT discarded several years ago. The Edge of Darkness vibe lifts on reaching Goonhilly’s control centre – which on my visit, in blazing autumnal sunshine, featured glaziers fitting new windows while listening to Steve Wright on Radio 2. When re-opened, visitors will be able to watch the work inside the control centre, hence the new windows. Inside, a team of students from nearby Falmouth University’s Alacrity graduate programme are working on developing and building a multiplayer game that will allow teams of four people to control a virtual space mission from Nvidia Shield gaming tablets. When the centre reopens, families and suits in corporate groups will be able to escape rainy days in west Cornwall by saving the International Space Station – or creating Gravity-style orbital havoc.